Lemons add color and a burst of flavor to many types of food and drink, but unless you're really committed to this citrus fruit, you probably don't want to eat a whole, fresh lemon on its own. Lemons have an extremely sour taste that can make them difficult to enjoy. Consuming their juice and pulp -- no matter what the form -- offers several health benefits, however. 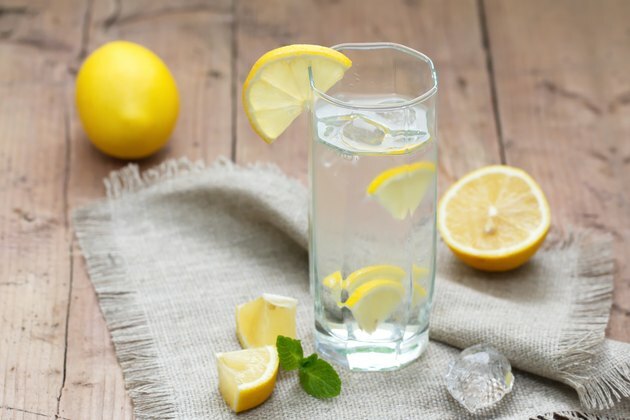 According to the U.S. Department of Agriculture National Nutrient Database, a 3-ounce lemon, without its peel, contains 44.5 milligrams of vitamin C. A 2-tablespoon serving of peel, however, has 15.5 milligrams of vitamin C. Vitamin C plays an antioxidant role in your body and can improve your immune system. Adult women should get 75 milligrams of vitamin C daily, while men should have 90 milligrams. A whole lemon provides a dose of dietary fiber that can help you work toward your recommended fiber intake. A 3-ounce lemon has 2.4 grams of total dietary fiber, while 2 tablespoons of peel has 1.3 grams. As such, the whole lemon provides more than 3 grams of fiber. In general, adults should get between 25 and 38 grams of fiber throughout the day, depending on their age. If you're able to eat an entire lemon, it won't significantly boost your caloric intake. Together, a 3-ounce peeled lemon and 2 tablespoons of lemon peel have about 30 calories, which is notably lower than many other fruits on which you might snack. A medium-sized apple, roughly 3 inches in diameter, for example, has 95 calories. Eating low-calorie foods is an ideal way to avoid weight gain. You don't need to struggle through eating a whole, fresh lemon to get the health benefits of this fruit. A simple way to enjoy the benefits of lemon in a mild form is to squeeze the juice of one segment of the fruit into your glass of water. Doing so gives the water some mild taste while keeping it far healthier and lower in calories than a number of other drinks, including fruit juice and soft drinks. You can also use a whole lemon in sauce for chicken or pasta, first squeezing the juice and pulp into the sauce, and then zesting the peel for an extra boost of flavor.